Within the manufacturing industry, there is a frequent need to produce parts or components to precise specifications on a repeatable basis. In turn, these requirements are satisfied by the use of state-of-the-art precision machining technologies to cut, punch, or drill through different types of materials. In many cases, these machining processes incorporate some element of heat (or superheat) to make those materials more flexible/pliable and thus reduce the time, cost, and/or energy required to complete the task. There will be times, however, when the materials in question might be sensitive to the high temperatures used in certain methodologies; these would be ideal circumstances to apply the process known as waterjet cutting. 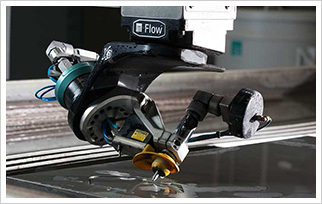 Waterjet cutting involves the use of a thin, high-pressure stream of water to produce parts, shapes, or components. The pressure of the water stream, or jet, is created by a specially-designed pump, and it is usually in the range of 50,000 to 60,000 pounds per square inch (PSI); the jet also contains an abrasive substance, customarily particles of garnet, to help in the actual cutting process. Since this can be a particularly loud/noisy process, the material being cut may be submerged in a tank of water as well. Waterjet cutters are versatile industrial tools that offer the capability to cut a wide range of materials to varying widths and depths and into many shapes and sizes. Since the waterjet cutting process is performed in the absence of heat, it does not change or interfere with the inherent structure and properties of the materials that are being cut; this can be particularly important when that material is some type of metal. Many of these savings and benefits are of course dependent on the accuracy of the cutting process and the overall effectiveness of its application; for these reasons, manufacturers in Toronto and throughout Ontario will rely on the services of Noble Precision for their waterjet cutting needs. To obtain further information on the precision manufacturing capabilities offered by Noble Precision, please visit our Capabilities page. For accurate waterjet cutting services that will meet your needs and specifications, call the precision manufacturing experts at Noble Precision today at 647-499-7569 or Contact us to request your no-obligation consultation.